Kylie graduated from Dentistry at the University of Queensland with First Class Honours before commencing three years with the Navy as a Dental Officer. Kylie worked in both Sydney and Canberra as a dentist and during this time also completed the Primary Examinations for the Royal Australasian College of Dental Surgeons, receiving the FG Christensen Medal for most outstanding performance. 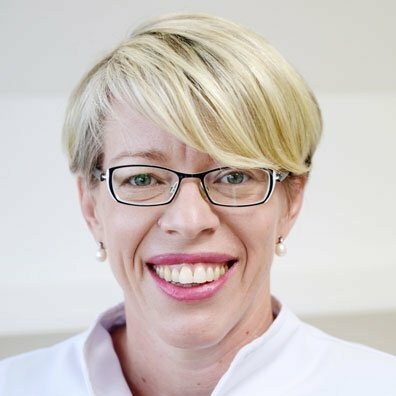 After completing her Masters in Dentistry, Orthodontics, at the University of Melbourne Kylie has worked in both private practice and as a consultant for the Royal Dental Hospital of Melbourne. Having previously acted as an Instructor in Orthodontics for the undergraduate Dental students, Kylie now focuses on lecturing Postgraduate students for the University of Melbourne in Orthodontics. In addition, Kylie has also served in several roles including Secretary for the Australian Society of Orthodontics, Victorian Branch. A mother of two children, Kylie also enjoys spending time with her family, gardening, trying to learn French and travelling.